A resort island in Nilai? The sky bungalows has a 70% take-up rate. The idea of offering island living in Nilai, Negri Sembilan, sounds like pie in the sky, but to gain attention in the competitive property market, you have to think big and different sometimes. The 350-acre Green Beverly Hills development in Putra Nilai (formerly known as Bandar Baru Nilai), with its inland resort island concept, is said to be the first of its kind in the world. 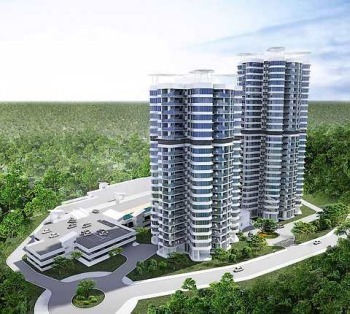 The brainchild of GD Development Sdn Bhd, Green Beverly Hills is on freehold land, and plans includes a five-star health-themed hotel, a 500,000 sq ft club house, condominiums, semi-detached homes, villas, and a shopping mall. The project, due to be completed in eight years, has a gross development value of RM4bil. 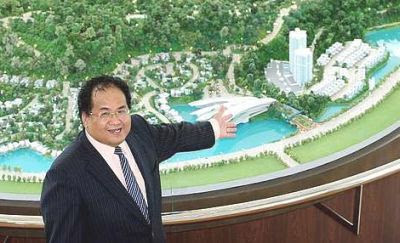 GD Development chief executive officer Lim Ching Choy says Green Beverly Hills was conceptualised as a upmarket residential community on a iconic lifestyle resort island. “As far we know, there is no other similar development in the world,” says Lim in an interview with StarBizWeek. At present, there are five lakes within the development. “We will link the lakes, and flood other areas, to create a canal system around the development, thus turning it into a man-made inland island,” he says. According to Lim, it is the company's joint chairman Datuk David Yeat Sew Chuong who comes up with the idea. Yeat is also the founder and chief executive officer of INS Bioscience Bhd, which is listed on the ACE Market of Bursa Malaysia. Lim has extensive experience in property development, having served as chief executive officer in Mah Sing Group Bhd and Magna Prima Bhd within the past nine years. He was also formerly the managing director of Ho Hup Construction Co Bhd. Engineering firm Angkasa Consulting Services Sdn Bhd, which has been involved in wetlands and lake developments in Malaysia and China, is the consultant for Green Beverly Hills. Access to the development, over its water channel, will be via three roads. The development is touted as being strategically located, with the South Klang Valley Expressway and North-South Expressway as highway links. “From Green Beverly Hills, it is a 10-minute drive to the KL International Airport (KLIA), a 15-minute drive to Putrajaya, a 35-minute drive to the Kuala Lumpur City Centre, and a 20-minute drive to Seremban. The Salak Tinggi KLIA Transit Station is just a five-minute drive away,” says Lim. He points out that institutions of higher learning such as the Inti International University, Nilai University College, Nilai International School and Universiti Sains Islam Malaysia are located close to the development. Also in the vicinity are the Nilai Springs Golf & Country Club, NCI Hospital as well as Tesco and Giant hypermarkets. Lim says other highlights of the gated and guarded development includes the availability of broadband Internet services, a “green environment” and a density of 5.7 units per acre (including condominiums) with about 2,000 planned property units. A closed-circuit television (CCTV) camera surveillance and CMS (central monitoring system) will be put in place for better security on the island. “Each house is linked to the CMS,” says Lim. Lim: As far we know, there is no other similar development in the world like Green Beverly Hills. Earlier this year, two blocks of Sky Bungalow condominiums with 334 units sized from 932 to 1,816 sq ft per unit, were launched. A unique feature of the Sky Bungalow condominiums, priced from RM487,200 to RM910,800 per unit, with one to three-bedroom types, is that each unit comes with a swimming pool. Smaller units have 5 x 10 ft pools while bigger units have 5 x 14 ft pools. “We can provide an option for heated water in the pools, depending on request,” says Lim. Another highlight here is the 12-ft ceiling of the units. One block of the Sky Bungalow condominiums is a 25-storey tower, while the other is a 20-storey tower. Also launched earlier this year were 17 units of four-storey Water Villa bungalows, each with a built-up area of 4,769 sq ft and priced at RM3.167mil. Each unit comes with a private lift. There are also 44 units of three-storey Garden Villa bungalows, each with a built-up area of 3,858 sq ft and priced at RM2mil. Lim is pleased by the take-up for the bungalows, as only two and 18 units of Water and Garden Villas respectively remain available for sale. The condominiums and bungalows are due to be completed by the end of 2014 and 2013 respectively. Now everyone can have a home? The robust property market is a double-edged sword. On one hand, the appreciation in property prices has the potential to churn out many more wealthy individuals and property developers are among the big beneficiaries of this strong property market. On the flip side is the increasing burden on the general public who have to cough up more to own a property today. The rising cost of living caused by creeping prices for a broad range of consumer items is a double whammy and will have a big impact on the middle and lower income groups. If left unchecked, it may result in greater disparities between the haves and have-nots. It is important that the Government's affordable housing programme be accorded top priority to ensure more reasonably priced housing units are built in various parts of the country. Initiatives such as the My First Home Scheme (MFHS) will serve to lighten the burden on young Malaysians aged between 18 and 35 purchasing their first house through the provision of 100% loan financing. The initiative will have a higher success rate if it is supported by enough sizeable land parcels dedicated for the MFHS projects, and reputable developers are roped in to build these schemes. And it is important that any concerns voiced out by the public and industry players be addressed and ironed out early on before they mar the success of this noble project. The Government's latest initiative to dedicate a portion of the old Sungai Besi airport land for quality affordable housing by the developer, 1Malaysia Development Bhd (1MDB) is most timely. Prime Minister Datuk Seri Najib Tun Razak says the scheme, dubbed Perumahan Rakyat 1Malaysia (Prima) to be launched next month, will offer homes at below market value as part of a public-private partnership to provide affordable housing. I believe another idea that can be adopted to help alleviate the hardships caused by rising house prices is to introduce “no frills” housing projects as an option for house buyers who choose to pay the minimum for a house. Just like the model adopted by low-cost carriers or budget hotels, buyers will only be charged what they have signed up for. If they opt for the no frills unit, they will only have to pay for the land, the house structure, and the can't-do-without items. Those who want to have their units fitted with all the usual finishing like decorative tiles, plaster ceiling and built-in furnishings, should also be given the choice to do so. This model will minimise wastage as it is a well known fact that many new house owners will choose to renovate their house before moving in. Many times, the whole interior structure and room partitions are knocked down, only to be rebuilt. If these house buyers are allowed to choose the “minimalist” unit instead of the standard “fully dressed up” one, they can save substantially on their property. Although offering such flexibility may mean more work and lower margin for developers, the one who has the foresight to take up this idea may stumble on a winning formula and win over a big customer following. Just like Air Asia's gutsy founder, Tan Sri Tony Fernandes who has taken budget air travel to a whole new level, a “no frills” developer will also emerge a big winner by moving into a new, uncontested market. It is heartening to note that amid the growing materialism among some sections of the populace, there are people who make it a point to serve and contribute, rather than be served. Many inspiring stories have emerged about individuals who are selfless and go out of their way to help other people and contribute towards a better world. Giving editorial space like what The Star is doing through the “Be Inspired” initiative, to individuals who have achieved success despite the odds stacked against them, and those who selflessly contribute their resources, either in kind, time or effort, for the well being of other people, can inspire others to take action and chip in however small the effort may seem. Although it may just be a mere drop in the vast ocean, the important thing is that we start to take action which cumulatively will become a force for more positive change to take place either on the individual or the society as a whole. And initiatives like “The Giving Pledge” by Microsoft co-founder Bill Gates and billionaire investor Warren Buffet, that asks the wealthy to donate half their fortune to charity, will hopefully give birth to more philanthropists among the super-rich. Having high profile individuals do their bit for the larger good of humanity is a great way to create awareness of the goodness of giving. I believe this is one of the positive effects of globalisation as the vast movement of people and multinational corporations turn the world into a big global village. Hopefully it will serve to instil greater empathy and lessen the differences between people from the various continents. There is no stopping the rapid globalisation underway now, and even the property industry is a party to this with more property developers taking to the global stage. This should be a golden opportunity for developers from the more developed continents, including those from Malaysia, to help out with efforts to house the many millions of homeless people, including slum-dwellers, in the poorer and less developed countries today. Deputy news editor Angie Ng hopes a “white knight” developer with a big heart will be the first to champion the “no frills” housing project model in Malaysia. The Kuala Lumpur-Singapore High Speed Rail (HSR) has been highly anticipated ever since the Malaysian Prime Minister announced in September 2010 the instigation of the HSR connecting the two neighbours. Initiated by YTL Corp Bhd way back in the late 90s, this RM8bil to RM14bil project has so far received mixed views from the public. HSR has been operating long ago in our Asian counterparts especially in Japan, China, Taiwan and South Korea. For comparison, China's HSR network by the year 2013 will be at 6,000 km, exceeding Japan's HSR network of 2,459 km. Last year, in the United States, the Obama administration invested US$8bil in federal stimulus money to create 13 high-speed rail corridors and billions of dollars of new business and tens of thousands of jobs are expected to flow to four hub cities Los Angeles, Chicago, Orlando and Albany, NY where plans for major high-speed rail networks are located. It was reported at the Conference of Mayors that the benefits of travelling between 110 mph and 220 mph will mean better connectivity, shorter travel times and new development around train stations. The changes will create 150,000 new jobs and some US$19bil in new businesses by 2035. The rail network is also expected to spur tourism, give businesses a wider pool of workers to choose from and help grow technology clusters in cities. Similar to experiences in other countries, in Malaysia, HSR will also generate substantial economic benefit to both countries, particularly Kuala Lumpur City Centre and the Iskandar region. The availability of HSR will shorten the distance between Malaysia and Singapore in terms of travelling time, hence attracting a larger pool of market catchment to stay in Malaysia and work in Singapore or vice versa. Straddling around 400 km, the proposed HSR will reduce travelling time to Singapore to 90 minutes compared to existing trains which take about seven hours. The significant reduction in travelling time will attract foreign companies to operate in Kuala Lumpur or Iskandar. While the occupation cost (gross rental rate) for prime office space in KL City Centre range between RM6 per sq ft (psf) and RM8 psf, the cost in Singapore range between RM25 psf and RM30 psf. Meanwhile, the current rental rate in Johor Baru, where most of the buildings are more than ten years old, range from RM1.40 psf to RM3 psf. The low rental market in Johor Baru is hardly surprising as it is mainly domestic-demand driven. With ambitious Iskandar initiatives coupled with various investment friendly policies, the HSR will further augur the Johor Baru office market, hence attracting more MNCs to operate in Johor Baru. Upon completion of the HSR, gross rental rate for new Grade A office towers in Iskandar is expected to hover between RM4.50 psf and RM4.80 psf, 50% to 60% higher than the highest rate achieved in Johor Baru city centre. Meanwhile, average selling price for existing condominiums in Johor Baru range from RM230 psf to RM370 psf. Capital value for existing condominiums in Johor Baru registered mixed performance from as high as 23% growth while some even noted depreciated values by -19%. Imperial@Puteri Harbour registered the highest selling price at RM400 psf. I believe the HSR will add vibrancy to the high rise properties in Johor Baru. Current average rental rate at RM2 psf in Johor Baru is estimated to increase by 50% to 60% arriving at RM3 psf, which is still below Kuala Lumpur rental rates, averaging at RM4.50 psf. Therefore, it is timely for the HSR to be in place as it will help improve demand from locals and Singaporeans for high-rise residential properties. The tourism industry has grown favourably, with tourist arrivals increasing from 5.2 million in 1997 to 24.6 million in 2010 in Malaysia and 10.2 million to 11.6 million in Singapore during the same period. The proposed HSR is also expected to create positive impacts to the tourism industry of both nations. With combined tourist arrival of about 35 million coupled with 90 minutes commuting time, Kuala Lumpur-Iskandar-Singapore will be able to position themselves as the transportation hub of South-East Asia as it will provide tourists a wider airline selection to choose from either in KLIA, LCCT or in Changi Airport hence, improving international access to the region. 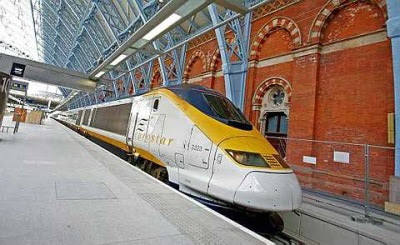 In addition, the HSR in Shanghai and Tokyo are one of the “must see” tourists' attractions in the respective countries. Manufacturing will remain as one of the sources of income to both nations. As land in Singapore is becoming scarce with limited land for expansion, coupled with escalating business costs, the HSR would enable some companies to expand or relocate to Malaysia, particularly in the Iskandar region. Moving manufacturing activities to Iskandar would allow the land to be used for even higher value activities. Malaysia's relatively liberal immigration policies and substantially cheaper labour costs in Iskandar compared to Singapore will reduce the operating costs. The relocation of manufacturing activities to Iskandar via the availability of HSR is expected to raise the contribution of the manufacturing sector to the nation's GDP by 6.5%. The closer cross-border link between Malaysia and Singapore will eventually position the region as the first South-East Asian “mega region” similar to Tokyo-Osaka via the Shinkansen Bullet Train, and Shanghai-Hangzhou via the Huhang High Speed Rail among others. While it is noted that existing mega regions are within the same country under the same political driver, with strong political determination, deeper mutual understanding and putting aside all long standing aggravation, Malaysia and Singapore can materialise the idea. We should learn from the European experience; the Eurostar train link has helped to strengthen economic activities in both London and Paris. In essence, the HSR will economically benefit both nations and strengthen economic ties between the two nations. A larger joint economy will result in larger land area, larger population and larger market, offering greater economies of scale. In addition, larger joint economy with a more diverse mix of skills, types of companies, types of business activities and greater variety of business locations, could accommodate the diversity of talents, business activities, consumer preferences and skill sets. All this will be made possible via improved connectivity by the High Speed Rail, which has been proven to stimulate local economies and act as a driver of growth and thus help spur property prices. KUALA LUMPUR: Tambun Indah Land Bhd expects to record strong revenue growth in the current financial year ending Dec 31, underpinned by the sustained property boom in Penang. Its managing director Teh Kiak Seng said on Friday, June 24 there was strong interest in its ongoing projects due to the rapid industrial expansion in Seberang Perai. This was also due to the spillover effect from the high demand for residential properties on Penang island. “At present, Tambun Indah has several ongoing projects on mainland Penang with total gross development value (GDV) of RM1.6 billion until 2016, which has positioned the group as a leading property developer in mainland Penang,” he said after the shareholders meeting. Teh said since the beginning of the year, the group has recorded an increase in sales, both in terms of units and value, from its various projects. “To date, we have sold more units than what we had sold in the first half of 2010. At this rate, Tambun Indah is likely to sell more units this year than what we did in 2010. Therefore, we are optimistic of a higher revenue base for FY2011,” he said. Launched in 2009 and 2011 respectively, Pearl Garden together with Pearl Villas have a GDV of RM277 million. “The RM277-million GDV projects are expected to contribute 45% to the group’s revenues in FY2011, compared to 35.1% in FY2010,” he said.